This paper makes the case for Integral Investing as a sustainable model for early stage investing and represents a summary of several academic articles published in prestigious publications over the past decade. 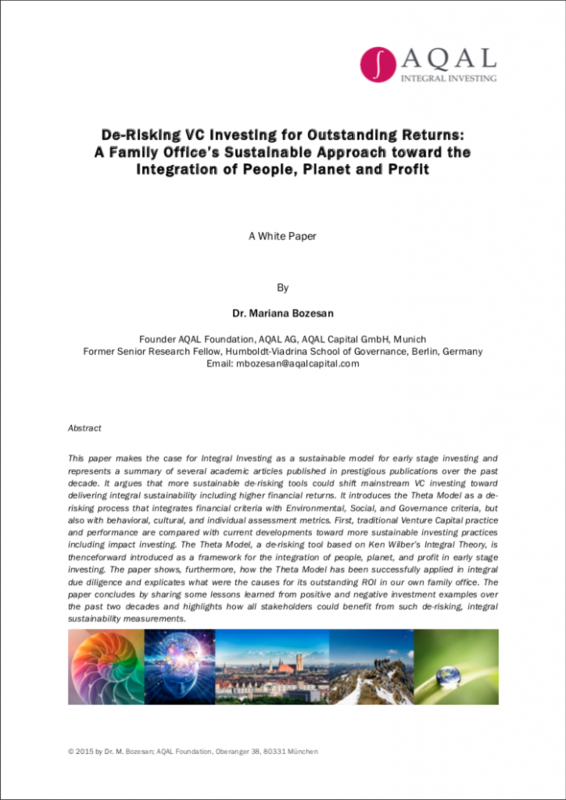 It argues that more sustainable de-risking tools could shift mainstream VC investing toward delivering integral sustainability including higher financial returns. It introduces the Theta Model as a de- risking process that integrates financial criteria with Environmental, Social, and Governance criteria, but also with behavioral, cultural, and individual assessment metrics. First, traditional Venture Capital practice and performance are compared with current developments toward more sustainable investing practices including impact investing. The Theta Model, a de-risking tool based on Ken Wilber’s Integral Theory, is thenceforward introduced as a framework for the integration of people, planet, and profit in early stage investing. The paper shows, furthermore, how the Theta Model has been successfully applied in integral due diligence and explicates what were the causes for its outstanding ROI in our own family office. The paper concludes by sharing some lessons learned from positive and negative investment examples over the past two decades and highlights how all stakeholders could benefit from such de-risking, integral sustainability measurements. The missing investors’ trust in the stability of economic development could be one of the main reasons for the current investment gap in developing countries. This paper contends that investing is driven also by emotional intelligence, which depends upon the levels of consciousness of participating agents. Research performed on 136 global investors is presented and the hypothesis that vertical development could influence investors’ confidence is subsequently tested. The paper asserts, furthermore, that investors’ trust could be enhanced and cultivated through the integration of appropriate metrics for people, planet, and profit. The Theta Model, a de-risking tool based on Ken Wilber’s Integral Theory, is thenceforward introduced as a framework for the integration of people, planet, and profit in early stage investing. The paper concludes by sharing some lessons learned from positive and negative investment examples over the past two decades and highlights how stakeholders could benefit from such de-risking, integral sustainability measurements. This paper makes the case for Integral Investing as a sustainable model for early stage investing. It argues that more sustainable de-risking tools could shift mainstream VC investing toward delivering higher financial returns and integral sustainability. It introduces the Theta Model as a de-risking process that integrates financial criteria with Environmental, Social, and Governance criteria, but also with behavioral, cultural, and individual assessment metrics. First, traditional Venture Capital practice and performance are compared with current developments toward more sustainable investing practices including impact investing. Then, the Theta Model is introduced as an evolutionary-based investment model rooted in Wilber’s Integral Theory. The paper shows how the model has been successfully applied in integral due diligence and what were the causes for its outstanding ROI. 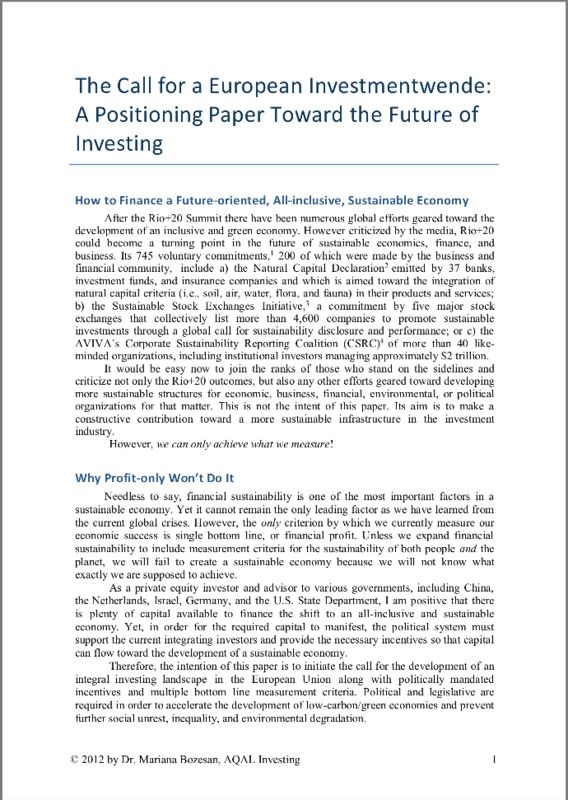 The paper closes by sharing the lessons learned from positive and negative investment examples and by offering a discussion on how all stakeholders from entrepreneurs to investors could benefit from such integral sustainability metrics in the future. This paper argues that the lack of investors’ trust in the stability of economic development could be one of the main reasons for the current global stagnation. It contends that investing is driven by emotional intelligence that depends upon the levels of consciousness of participating agents. The research performed on 136 global investors is then presented and tested the hypothesis that more trust in the future could be achieved through vertical development. The paper asserts, furthermore, that more trust in investing could be cultivated through the integration of appropriate measurements for people, planet, and profit on the investment side. The Theta Model is then introduced as an evolution-based, de- risking tool based on Ken Wilber’s Integral Theory. The paper concludes by sharing some lessons learned from positive and negative investment examples and how all stakeholders could benefit from such integral sustainability measurements in the future. This two-part article proposes using Integral Theory as the foundation of a more sus- tainable investing practice, named here integral investing. This evolving investment concept, which crystallized over the past two decades in my personal investing practice, is a condensation of sev- eral papers presented at various finance, economics, and sustainability conferences. 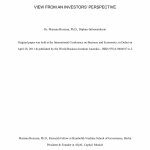 Part 1 sup- ports the proposal through investigations performed on 1) current investing structures, 2) global initiatives and trends, and 3) 132 leading-edge individual investors who have apparently evolved to later stages of human development. This research is revealed using Joseph Campbell’s conception of the hero’s journey. Based on the Integral framework, Part 2 of the article introduces a possible path toward a more sustainable investing practice that is based on evolution and the essence of all existence, considering interior as well as exterior realities. In this model, financial returns must be inseparable from a deep impact on the social, environmental, cultural, and behavioral aspects of reality as well as human development and evolution. This paper highlights the major collective and individual threats faced by humanity today and argues that money alone will not provide the desired relief. Instead, it contends that only sustainable solutions that consider all life perspectives and are rooted in higher levels of consciousness can succeed. After introducing Wilber’s Integral Framework as a theoretical foundation for this kind of sustainability, the paper emphasizes the importance of leaders and leadership. It presents leading edge research performed with top business executives from Fortune 500 and other companies. Furthermore, it explores the phenomenon of becoming a consciousness leader as a premise for creating sustainable businesses that transcend the current socio-economic, geo-political, and environmental challenges. Consciousness leaders are people who have evolved beyond post-conventional levels of human development. As a result, they have become integrally informed human beings who feel, think, and act in globally sustainable ways for the benefit of all. 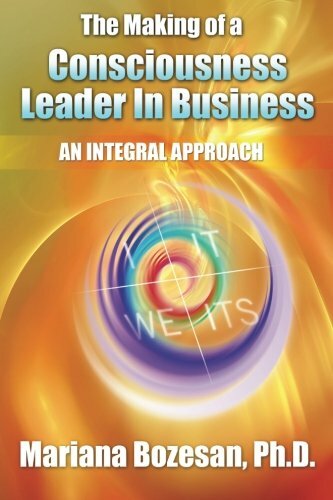 The exploration of becoming a consciousness leader in business reveals not only the interiority of exceptional leaders, but supports a paradigm shift in leadership, business, and sustainability. This understanding may also provide encouragement, inspiration, and hope to those who are actively involved with wealth creation in a business environment as well as to those who struggle to live a life of meaning within the same context. 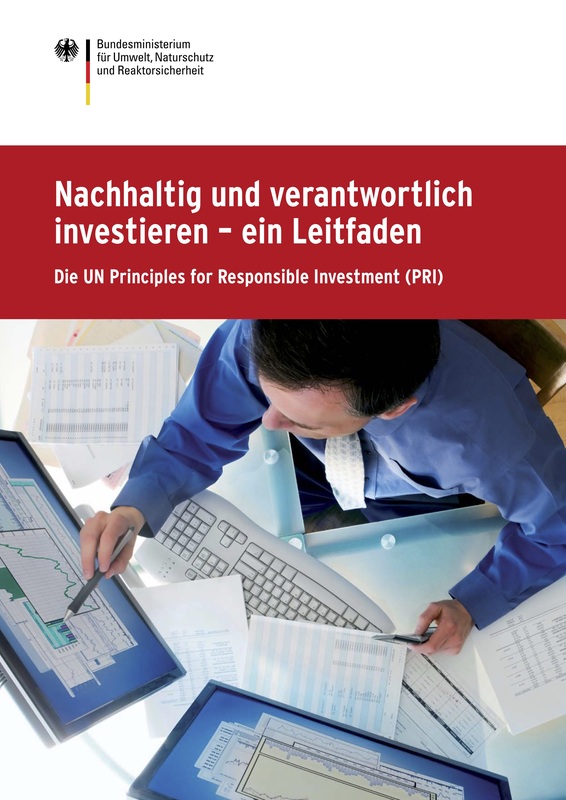 Dr. Bozesan participated as an Advisory Council member to the German Ministry for the Environment (Deutsches Umweltministerium) for establishing the guidelines for the adoption of UN PRI in Germany, May 2013. The future of global capital and business is tightly connected to the future of investing. This paper presents the latest research and development in capital, philanthropy, investing, and business leadership from an investor’s perspective. 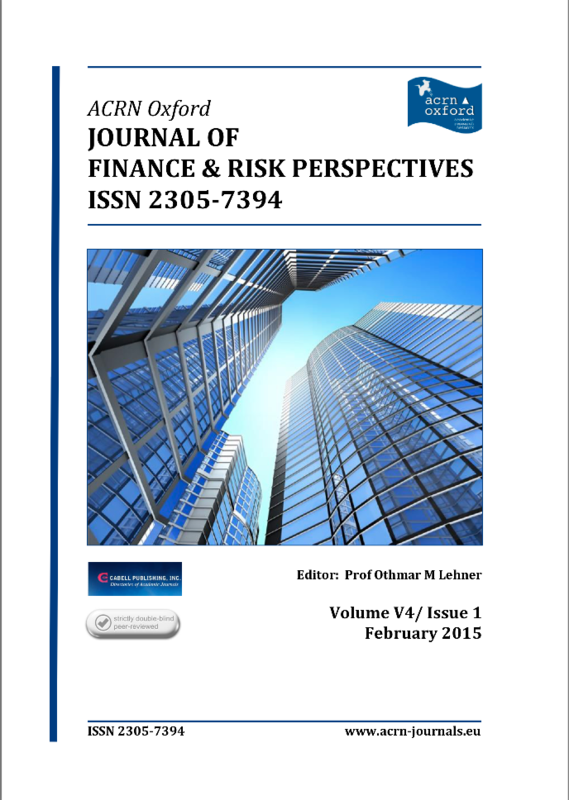 Based on current trends, the paper argues that the future of both business and investing must be integrally informed and be based on the essence of all existence, the interior as well as exterior reality; a reality in which high financial returns are inseparable from high social, environmental, cultural, ethical, as well as the individual happiness impact. Moreover, the paper contends that the current crises such as economy, finance, ecology, climate, water, health care, educational, food, security, energy, natural resources, poverty, and bio-diversity can be reduced to one common denominator, namely a consciousness crisis. This crisis manifests as lack of global leadership of traditional players. Therefore, this paper contends that only a quantum leap in consciousness evolution of global leaders has the opportunity to unleash the leadership qualities necessary to overcome the current challenges and catapult humanity toward the next level of existence. From an investing perspective, the paper shows why the financial crisis has and will continue to shaken the dominant position of the so-called High Wealth Countries whereby accelerating the trend toward a more even playing field between the wealth of developed and developing countries. After introducing the notion of integral investing, integral investor, and integral business as the next evolutionary step, the paper highlights the barriers to aggregating more capital toward integral investing worldwide and presents several ways out. Contribution Dr. Mariana Bozesan in - Club of Rome Report 2017: Come on! Current worldwide trends are not sustainable. The Club of Rome’s warnings published in the book Limits to Growth are still valid. Remedies that are acceptable for the great majority tend to make things worse. We seem to be in a philosophical crisis. Pope Francis says it clearly: our common home is in deadly danger. Analyzing the philosophical crisis, the book comes to the conclusion that the world may need a “new enlightenment”; one that is not based solely on doctrine, but instead addresses a balance between humans and nature, as well as a balance between markets and the state, and the short versus long term. To do this we need to leave behind working in ”silos” in favor of a more systemic approach that will require us to rethink the organization of science and education. However, we have to act now; the world cannot wait until 7.6 billion people have struggled to reach a new enlightenment. 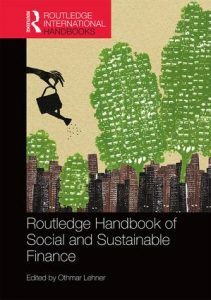 This book is full of optimistic case studies and policy proposals that will lead us back to a trajectory of sustainability. But it is also necessary to address the taboo topic of population increase. Countries with a stable population fare immensely better than those with continued increase. Finally, we are presenting an optimistic book from the Club of Rome. The Club of Rome Report "Come On!" is available here. Beitrag Dr. Mariana Bozesan in - Club of Rome Bericht 2017: Wir sind dran! Der Club of Rome Bericht "Wir sind dran!" ist hier verfügbar. 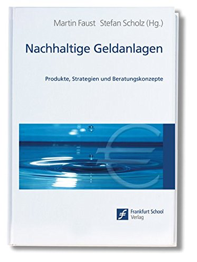 Link zum Angebot des Taschenbuchs "Angel Investing at its best: Leitfaden für Business Angels II" hier. Letter to chancellor Angela Merkel in which Dr. Mariana Bozesan called for the Investment Turnaround in 2012. The Social Impact Investment Taskforce is an independent taskforce launched in 2013 under the UK’s presidency of the G8. Over the last fourteen months, it has brought together government and sector experts from the G7 countries, the European Commission and Australia to fulfil its mandate to report on ‘catalysing a global market in impact investment’. This report presents a summary of the Taskforce’s key findings and recommendations. It does not necessarily reflect the individual opinions of members of the Taskforce, its Working Groups or its National Advisory Boards, or the official positions of the organisations and governments they represent. Where exactly within Germany’s system of social services and among socially motivated organisations is there a need for social impact capital? Under what conditions can social impact investment capital be mobilised to finance social impact in Germany and in developing and emerging countries? How can the factors driving success in social programmes be captured and communicated in order to attract private actors to the SII sphere? What support structures are necessary in order to facilitate or strengthen the use of SII both domestically (in Germany) and internationally (investments originating from Germany)? The answers to these questions will provide an initial assessment of SII’s potential within the German context and outline its current limitations. On this basis, several recommendations will be made with the aim of developing and anchoring SII as a method for financing social outcomes both at home and abroad. Spinkart, K.P., & Gottwald, F.-T., (2013). 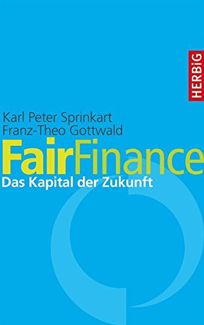 FairFinance: Das Kapital der Zukunft; Auswege aus dem Raubtierkapitalismus. (p. 162). München: Herbig. Mörderische Risiken, Zinsmanipulationen, Rekord-Boni und Bankrotterklärungen die Exzesse des Kasino-Kapitalismus haben das Vertrauen der Menschen in die Finanzwelt zerstört. Wem kann man sein Erspartes noch anvertrauen, wer wirtschaftet verantwortungsbewusst? Karl Peter Sprinkart und Franz-Theo Gottwald stellen echte Alternativen für all diejenigen vor, die ihr Geld nachhaltig anlegen und zugleich Gutes bewirken wollen. Das Spektrum reicht von Mikrokrediten und Regionalwährungen über Banken, die nach ethischen Kriterien in gesellschaftliche Zukunftsprojekte investieren, bis hin zu innovativen Fonds, die neben wirtschaftlichen auch soziale Renditen erzielen. So wird Geld wieder das, was es sein soll: ein Mittel, um die Zukunft sinnvoll zu gestalten. Horst, D. (2014). Nachhaltige Geldanlage als Problembegriff. In Faust, M. & Scholz, S. (Eds.) Nachhaltige Geldanlagen: Produkte, Strategien und Beratungskonzepte. (pp. 151-166). Frankfurt: Frankfurt School. In this research, computer scientist and psychologist Mariana Bozesan explores the phenomenon of becoming a consciousness leader within a business environment. Consciousness leaders are people who have evolved to postconventional levels of interior development and are engaged in globally sustainable wealth creation for the benefit of all. The presented research employs Wilber's integral map of consciousness and the newly designed qualitative method named heuristic structuralism. The nature, meaning, and cause of transformative experiences of the researched executives-from companies such as Coca Cola, Colgate, Palmolive, and major venture capital firms-have been investigated along with the structural impact over time. The exploration of becoming a consciousness leader has not only revealed the interiority of exceptional leaders, but it supports a paradigm shift in leadership, business, and capitalism in general. This understanding provides encouragement, inspiration, and hope to those who are actively involved with wealth creation in a business environment as well as to those who struggle to live a life of meaning within the same context. Interview on Consciousness Leadership published in "Führung mit Sinn"
Neuer Blick auf das bekannte thema Leadership: Was ist der Sinn von Führung? Das Buch unterstützt Führungskräfte darin, den Weg zu nachhaltiger Führung zu gehen, unbequeme Fragen zu stellen und ihren Führungsbeitrag Schritt für Schritt neu zu definieren. Anhand von Coaching Gesprächen mit 14 Führungspersönlichkeiten aus acht verschiedenen Ländern und Interviews mit ausgewählten Persönlichkeiten zeigt Petra Künkel, wie wir wieder Verbindung mit unserer Suche nach Sinn aufnehmen können. Das Werk richtet sich an Führungskräfte, die sich als Folge gesellschaftlicher Entwicklungen, innerer Krisen oder Veränderungen ihrer Unternehmen die Frage nach ihren eigenen Werten stellen und wie sie diese mit ihrer professionellen Aufgabe in Einklang bringen.